I sat around today. Literally all day long – our task today was to perform a 12 hour-long waterhole gamecount at Bellebenno. So we got up at 4 (okay, I admit it – we got up at 4:30 or something…), prepared some sandwiches, a little bacon for lunch and packed our hard-boiled eggs, then off we went at 5:25 (we had planned to leave at 5:15, but this… is Africa). 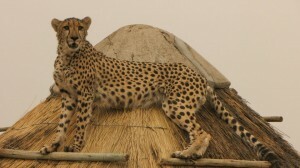 Markus and I arrived at our waterhole at 6:02 – and climbed our treetop hide. About 8 metres high, this hide is something for the adventurous. I myself have been up there last year already, but coming back to the same spot again was a nice touch. The hide is about one by one metres, and barely 1.80m high. Standing is therefore not recommended, but you’ll have to try every once in a while since there are only wooden bars in place of seats, so sitting requires a lot of body fat or plenty of pillows. Since we don’t have enough of the former, we decided to bring a blanket and pillows. Turned out to be a good choice since the morning was cold and quite wet; however, it didn’t rain as much as we were afraid it would. Then the waiting began – waiting for animals, and whenever we saw one (or a group), we’d take notes of how many, what species, when they arrived and when they left. We also tried to determine the animal’s genders, and while that might be easy from up close, sitting up there at quite some distance from the hole doesn’t make things easy. We filled two pages during our observation period which seems to be a good average. We saw lots of oryx, eland, warthogs, a few jackals and, shortly before leaving, two giraffe. Not to mention the huge flocks of Guinea Fowls.